Like a toy on a spring wound up again and again, the Parkfield segment of the San Andreas Fault should have snapped sometime in the late 1980s or early 1990s, according to the time-predictable model of large earthquakes. The fault segment had failed regularly about every 22 years until 1966, and then, nothing. That last earthquake, at magnitude 6.0, has left geologists and residents of Parkfield, Calif., waiting for the next one ever since. 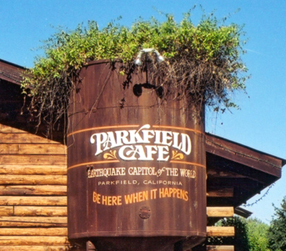 A water tower in downtown Parkfield claims the city as the "Earthquake Capitol of the world." Photo by Alvin Chan. This lack of performance, though disappointing, allowed Jessica Murray and Paul Segall of Stanford University to begin to disprove the idea that faults occur on a predictable cycle that depends on stress accumulation over time. The time-predictable earthquake model was first quantified in the literature in 1980, by Shimazaki and Nakata, but the idea goes back to H.F. Reid and his fabled analysis of San Francisco's 1906 earthquake, for which he postulated on elastic rebound recovery. Presumably, the amount of stress accumulated over time along the same stretch of a fault should be the same to set off a major earthquake each time. Using several methods and two different data sets of strain accumulation, Murray and Segall report in this week's Nature that the Parkfield segment reached that recovery point threshold sometime between 1973 and 1987 - and then exceeded it, and Parkfield still did not fail. Some of the possible explanations for the failed predictability of this formerly clockwork-like fault are fault interactions nearby. The Coalinga earthquake in 1983, for example, may have changed the stress regime in the region and delayed the occurrence of an earthquake on the nearby Parkfield segment. Nevertheless, Murray and Segall have shown that the stress and strain accumulations at Parkfield are probably far beyond what triggered earthquakes there in the past. Parkfield is now the most instrumented fault in the world, and a particularly apt place to study fault failure. If it ruptures again, the data will be a goldmine. But it will only be a log of one event, and that is not enough for scientific rigor. The same argument goes for Murray and Segall's first run at disproving the time-predictable model of earthquakes. 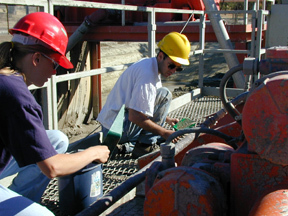 Jessica Murray and Berkeley graduate student Matt d'Alessio collect samples from the material that came up out of the SAFOD pilot hole during drilling (Geotimes September 2002). Photo courtesy of Murray. "For years we have been talking about the recurrence time of Parkfield earthquakes, but if they are really different in character, 'recurrence' may be a misleading term," says David Jackson, a geologist at the University of California at Los Angeles. 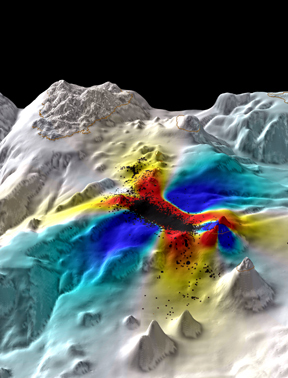 Jackson agrees with scientists who question whether time-predictability works as a model on the premise that the occurrence of "similar" earthquakes on a fault is unlikely. If past earthquakes on the Parkfield segment were different enough from each other, then magnitude and slip distribution along a fault must be considered in models of predictability. Ross Stein, a seismologist at the U.S. Geological Survey in Menlo Park, agrees that Murray and Segall could go back and look at past Parkfield earthquakes to see if their conclusions apply. "You'd want to know, do they see all earthquakes as occurring late?" Stein says, "or some early, some late, and that the system is not as dependable or as regular as we think." "This is a case where highly competent scientists have zeroed in on a situation which should come as close as one can get to testing a hypothesis that underlies so much of the way we all think," Stein says. "They should now try to do this elsewhere, and Japan probably offers the best chances for doing this." Stein says that this is the most thorough effort so far to show that time-predictability is not quite right, as Murray and Segall have looked rigorously and methodically at strain accumulation, not just at the magnitude of past earthquakes. If this model proves wrong for short-term periods, the impacts on hazard assessment remain to be seen, he says. 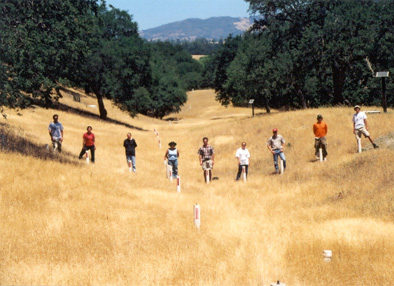 Researchers with Murray (third from left) pose along a fault trace at Carr Hill, south of Parkfield on the west side of the San Andreas Fault. Photo by Jennifer Adleman. "In a long-term average sense, [the time-predictable model] can be a good description," Murray says, "but when it's applied to more short term predictions, predictions that are made on a 30-year time scale, we're showing that it doesn't work." During the summer of 2000, more than 7,000 earthquakes rumbled beneath the Pacific Ocean, 75 miles south of Tokyo amidst the Izu Islands. One of the most dense networks of GPS (Global Positioning System) receivers and seismometers in the world registered each centimeter of earth shifting and shaking. A team of geophysicists capitalized on this rich data set to test a theory about what causes earthquakes, especially prolonged swarms associated with volcanism. Their results help validate the seismicity-rate theory developed by Jim Dieterich of the U.S. Geological Survey in 1994. The theory rests on first principles and laboratory experiments but has rarely been tested in the field. "This is the best test of Dieterich's theory," says Chris Marone, an expert in earthquake mechanics at Pennsylvania State University. One of the theory's key predictions is that earthquake frequencies increase as stress rates on the Earth crust increase. The study, published in the September 5 issue of Nature, finds this relationship in the Izu Islands volcanic chain. During the summer of 2000, magma intrusion into the Earth's crust triggered a swarm of 7,000 earthquakes in the Izu Islands south of Tokyo. The colors indicate the changes in stress rates caused by the intrusion (warm colors indicate increases in stress rates, cool colors indicate decreases). Earthquakes, as marked by the black dots, occurred much more frequently in areas with high increases in stress rates. Image by Serkan Bozkurt, USGS. "The blade expanded for seven weeks and constantly stressed the crust up to 1,000 times normal. It sped up the seismic clock," says Ross Stein, a U.S. Geological Survey geophysicist and co-author of the study. The team used slight deformations in the Earth's surface to infer the geometry of the magma intrusion and how it changed stress rates within the crust. Layering a map of the observed earthquake frequencies on top of the calculated stress rates yields the predicted relationship between frequencies and stressing.